Seven stone diamond rings with exceptional and affordable beauty from simple seven stone eternity to more fanciful Raindance inspired diamond rings, we have a unique design to create your perfect ideal ring. Christie - This spectacular diamond engagement ring dazzles with an overwhelming show of diamonds, claw set into a truly breathtaking design. Choose your central diamond, matched to an additional 0.30cts of brilliant cut diamonds, extending out along each diamond set shoulder. For the Christie diamond engagement ring, choose either a 0.30cts, 0.40cts, 0.50cts or 0.60cts for your central diamond. Included are an additional 0.30cts of dazzling brilliant cut diamonds. Please allow 5-6 weeks for your ring to be crafted—delivered in pristine Serendipity bespoke packaging. Elegant vintage styled diamond ring with milgrain diamond set shoulders, and central round brilliant cut diamond with attractive triple claw detail. Beautiful, elegantly crafted vintage styled diamond ring named 'Fern' with antique styling and milgrain edge detail. Shoulders are grain set with small 0.12 carats of diamonds. Plain section of shoulders features knife-edged ridge detail. Choose from 0.25 carats to 0.60 carats for the central diamond held within dainty triple claws. A winning design with a beautiful vintage feel. Wood boxed and gift packaged. Please allow 5-6 weeks max. for delivery. Quite literally a diamond for every day of the week. Seven diamonds held within a unique diamond ring design, in a variety of styles, from the half eternity style of ring, to the Raindance inspired ring style iconic designs made famous over several decades. For some, the significance of the number can relate to an anniversary, an age, or a duration in years for a partnership. 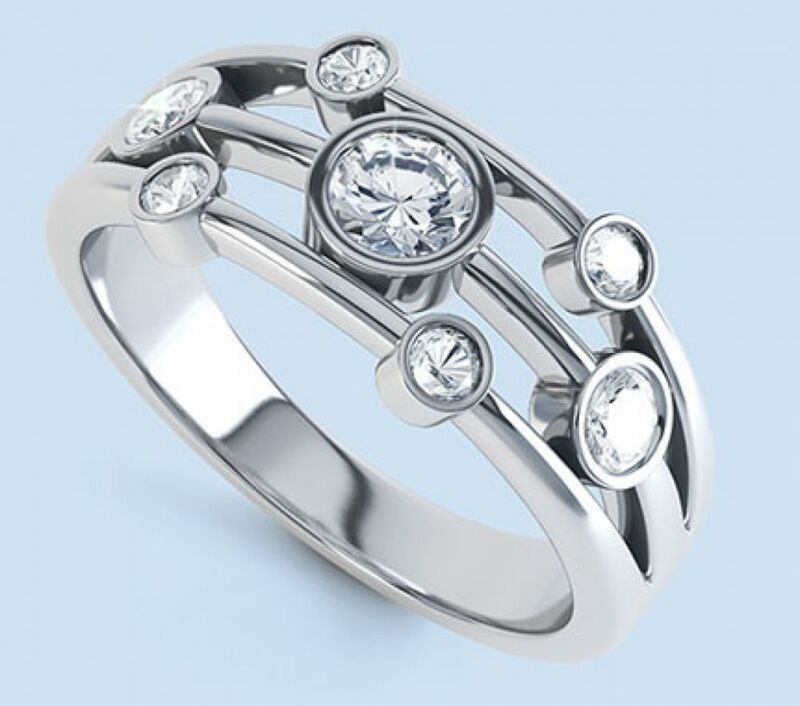 Many styles are designed and set with settings running along the profile of the ring, whilst other designs radiate out and arc in a fan like shape across the hand. 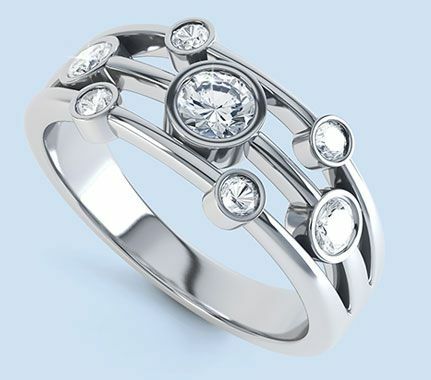 Some styles work from a single band, whilst other designs have the diamonds spread out over multiple bands, as we see in the Raindance inspired ring designs already referenced here. Both straight sets and graduated seven stone rings are within this category, each presenting an equally different look, from the diamond set band, more akin to the wedding ring style, to the right hand ring, dress style, perfect for an evening of sophisticated cocktails and conversation. on a final note, why have a ring with one diamond, when quite literally you can have several!